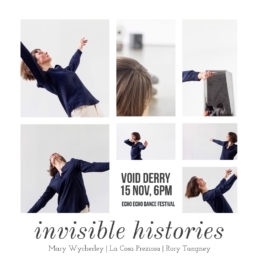 Invisible Histories is a much anticipated new dance work by choreographer and performer Mary Wycherley, bringing together sculptor Rory Tangney and award-winning sound artist La Cosa Preziosa for a captivating experience exploring time and memory, created specifically for gallery environments. 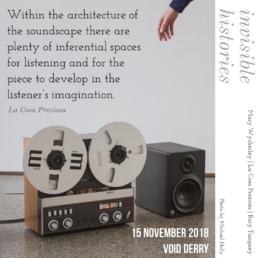 Invisible Histories premiered at Limerick City Gallery of Art on 14th July, before touring to partner galleries VISUAL Carlow, West Cork Arts Centre and the VOID in Derry. Mary Wycherley approached Bold&Brass to run their social media marketing campaign for the 2018 Tour, which involved multimedia content creation mixing the different aspects of the piece: sound, video, photography and academic writing. Framing memories not as fixed narratives from the past but as transforming collisions with the present, the piece evokes an atmosphere rich with sensations, images and emotions and allows us to consider the past re-written in the present. Co-created by choreographer Mary Wycherley, sculptor Rory Tangney and sound artist La Cosa Preziosa, the work navigates the historical and conceptual frame of the gallery through the lens of dance and opens a vivid and porous encounter between performer, sculpture, sound and space.